Talk about animal love. 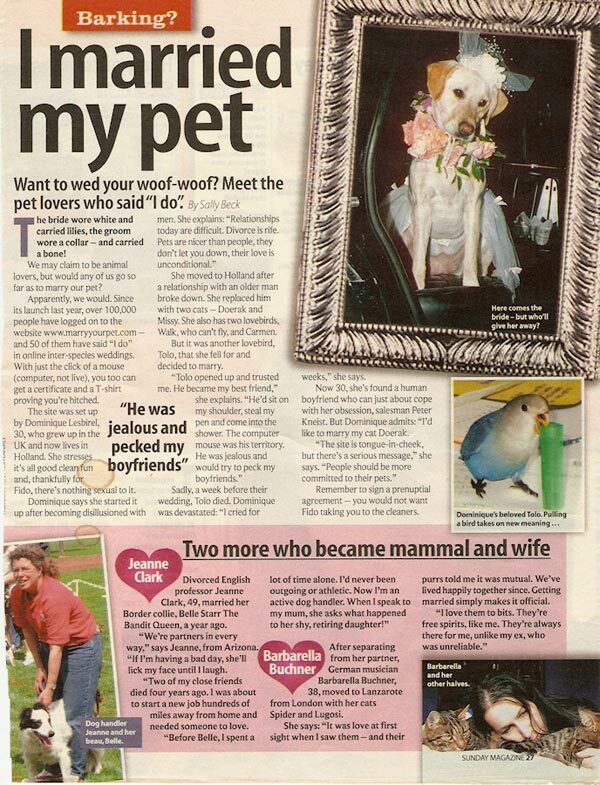 It seems Dutch woman, Dominique Lesbirel has a thing for pets, case in point, the 41 year old woman’s declaration that she is now set to marry her dog, Travis after the death of her most recent husband, her pet cat of eight years. Pause, look out the window, notice all the fluffy cats and dogs running through the fields with chocolate waves strolling in the distance …. The woman’s decision to marry Travis comes after her previous husband died of kidney failure. Dominique Lesbirel’s former husband was 19 when he died. That’s cat years, which for those curious translates to an impressive 92 in human years. Indeed some decorum is in need…. According to Lesbirel, she first came to meet her future husband, Travis, when she was living in Greece and the then stray dog crossed her path. Yes gushing love bursting from the seams. But things one day suddenly took a turn for the diabolical, forcing Dominique Lesbirel into a make or break decision. With Travis struck with a life-threatening virus, Lesbirel decided in order for the dog to live she needed to take him in full time, with the couple having been together ever since. 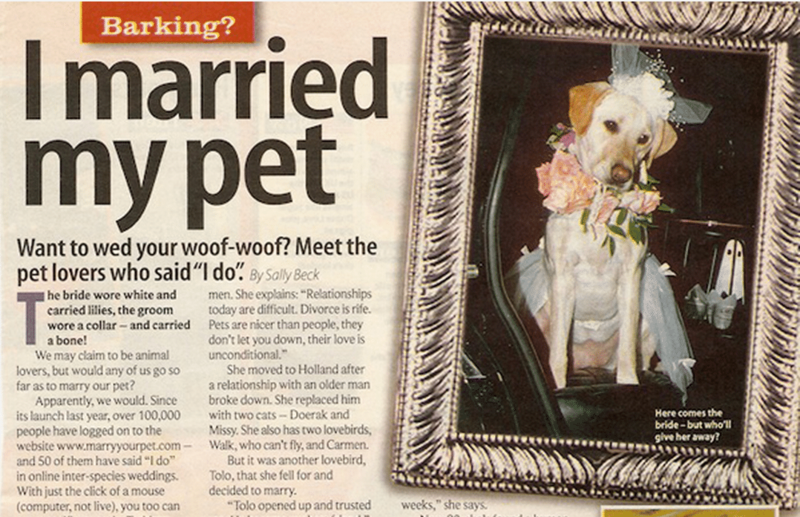 The upcoming ceremony will be carried out through Marryyourpet.com, a website which Lesbirel set up in 2003. The site boasts several thousand visitors a day and Lesbirel, who lives in Holland, pronounces several couples a month lawfully wedded pet and owner. After their applications to marry are approved, each couple is taken to a virtual chapel on screen, where they exchange vows. The happy couple then click a button to say ‘I do’ and Lesbirel, who became ordained online, sends them a certificate. To boot Lesbirel encourages couples to regard their nuptials like any other normal wedding, with the need to make necessary plans in advance, from inviting friends and throwing lavish parties to celebrate. But lest one think that Dominique Lesbirel marries any owner and their pet, Lesbirel has other news. Rightly so one might concur. Whilst the novelty of marrying one’s pet has its own particular charm and childish whim, Lesbirel concedes that she does have her detractors who take pleasure in sending her hate make and even death threats. ‘We’d be lost without those happy little faces at our windows, so I’ll do anything I can to remind people to treat animals with love, kindness and respect. What do you think? Will you be seeking to marry your pet dog or cat once your current spouse dies, cheats or just fails to give you the abundant unconditional love you crave?